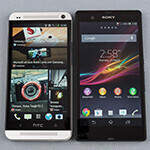 Sony Xperia Z and the HTC One will be one of the main flagship competitors this season, so a thorough comparison is warranted to help you choose. The phones weigh about the same, but One is shorter and narrower than the Xperia Z, which should help for better one-handed control, if its pretty aluminum unibody wasn't so slippery compared to the rubberized edges of Sony's phone, that allow for a much better grip. Moreover, the rubbery feeling of the Xperia Z has a perfectly good reason to be there, as the phone is waterproof, if you are looking for rugged before pretty, and still thinner than the One, despite the watertight body. HTC, however, has graced the One with a timeless precision-cut aluminum chassis that sticks out like a sore thumb in the sea of plastic Androids. Not only that, but we get two amplified stereo speakers at the front, and also an IR blaster integrated in the power/lock button up top. This same button Sony has placed in round metal form on the right where it belongs, directly under your thumb, while you have to stretch each time to reach it on the One. 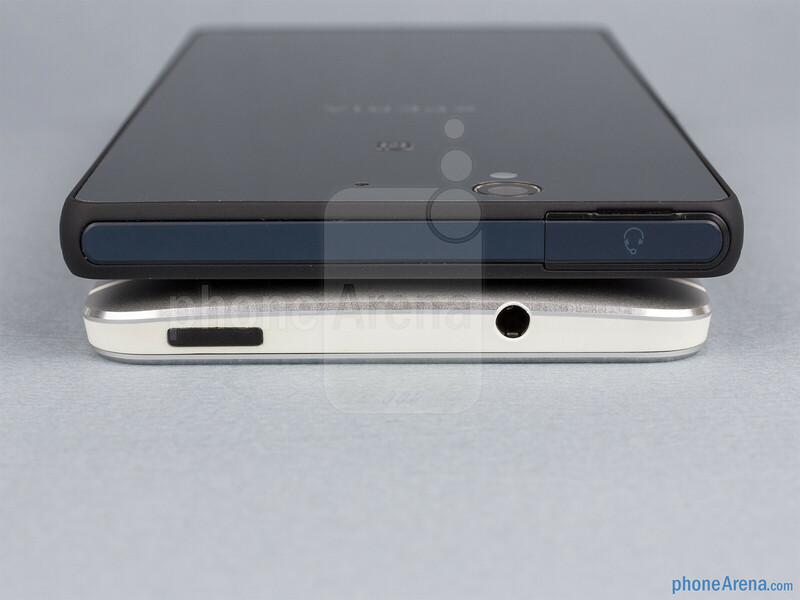 The overly thin volume rocker of the Z, however, is right smack in the middle of the right side, making it uncomfortable to feel and press, compared to the jagged one-piece metal key of the HTC One. 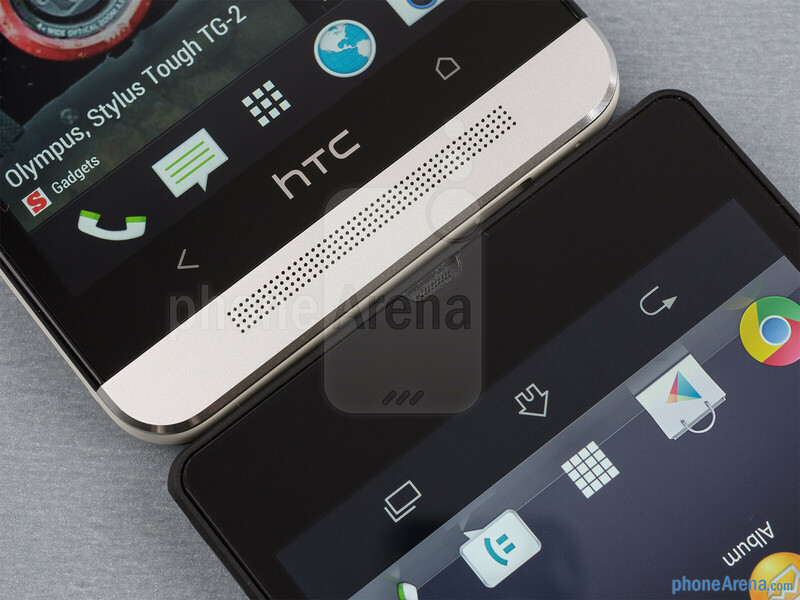 Both handsets sport Full HD 1080x1920 pixels displays, with the HTC One having a slight edge in pixel density, as it sports a 4.7” panel, compared to the 5-incher on the Xperia Z. 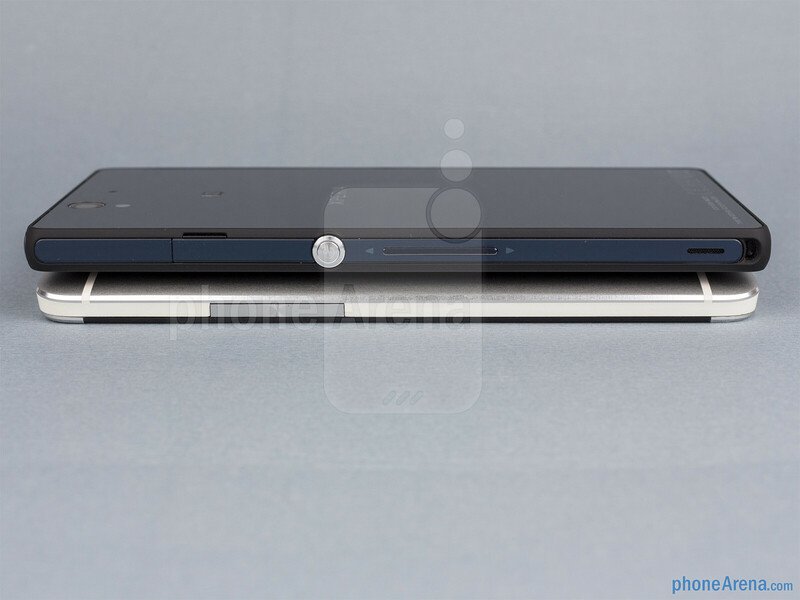 The pixel densities, however, are more than you need, and not the main advantage of the HTC One's display before the screen on the Xperia Z. 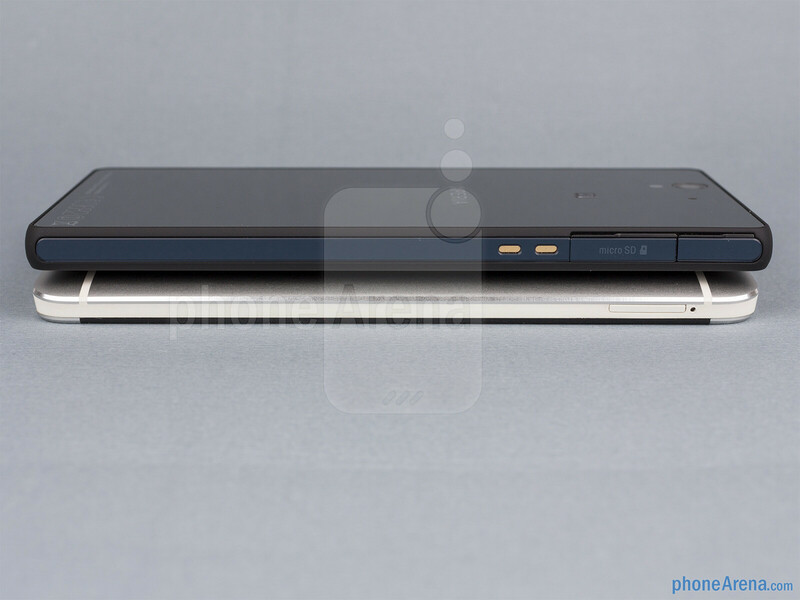 The colors and contrast of the 5” panel in the Xperia Z look much worse than on the HTC One. Even when looked at head-on, the Xperia Z exhibits washed-out tones and pretty greyish blacks in comparison to the vibrant colors and high contrast ratio of the One. Tilt the Z even a little, and the picture becomes significantly paler and even more washed-out, whereas the One sports one of the best viewing angles we've seen on a mobile display. Thus the screen on HTC's phone excels in everything compared to the one in the Xperia Z, save for the all-important brightness category, where both phones are pretty close, with a slight advantage of the HTC One in terms of outdoor visibility. Not always at 1.7 :) Fluctuates depending on CPU intensity. Just like any cpu that has been around for years now. both software and hardware htc one smock z.. great job HTC.. it beats Competitors one after another.. this handpeace deserve to be best phone this year.. c`mon htc and bering for us another surprise by new tablet..
WHAT IRONIC!!!! 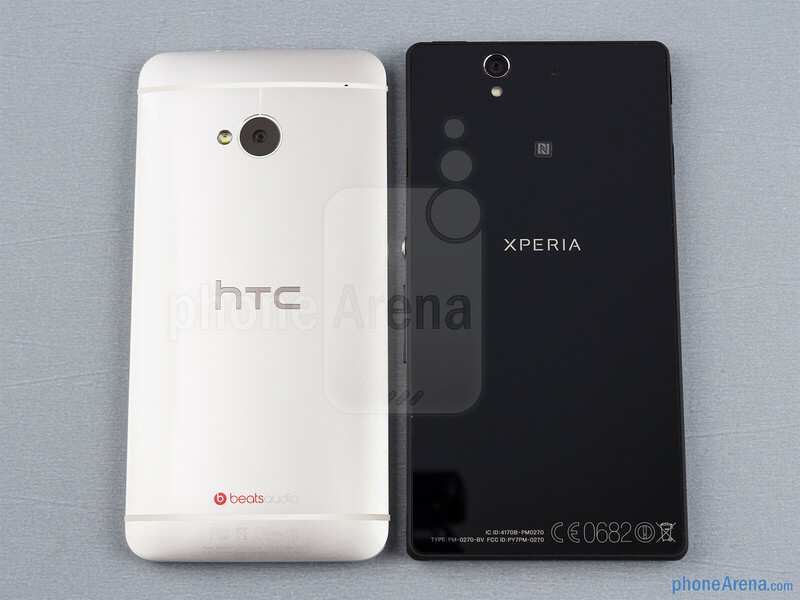 HOW YOU CAN SAY THAT XPERIA Z GOT WASHED OUT VS HTC ONE? CHECK THISSSSSS!!!!!!!!!!!!!!! 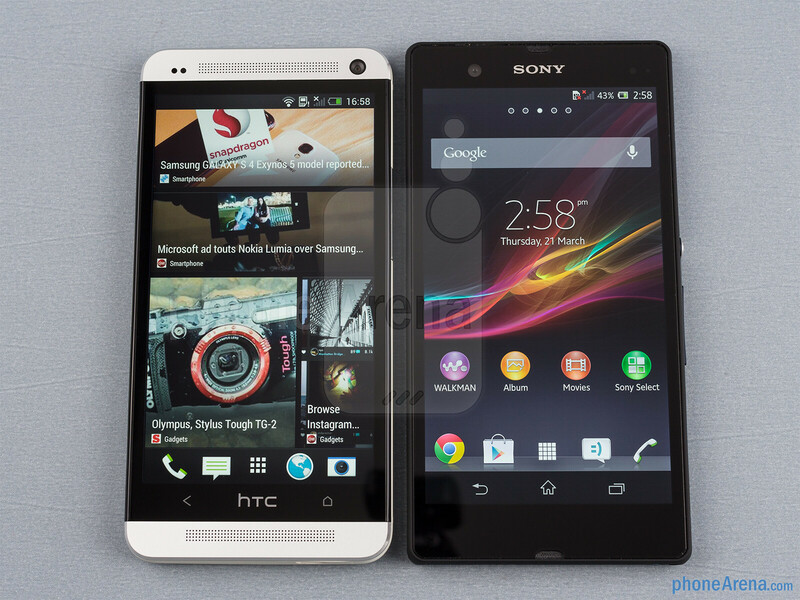 search on youtube :HTC One vs. Sony Xperia Z : HD video streaming Blue, Green, Red, Yellow and white on Sony more vibrant!!!! 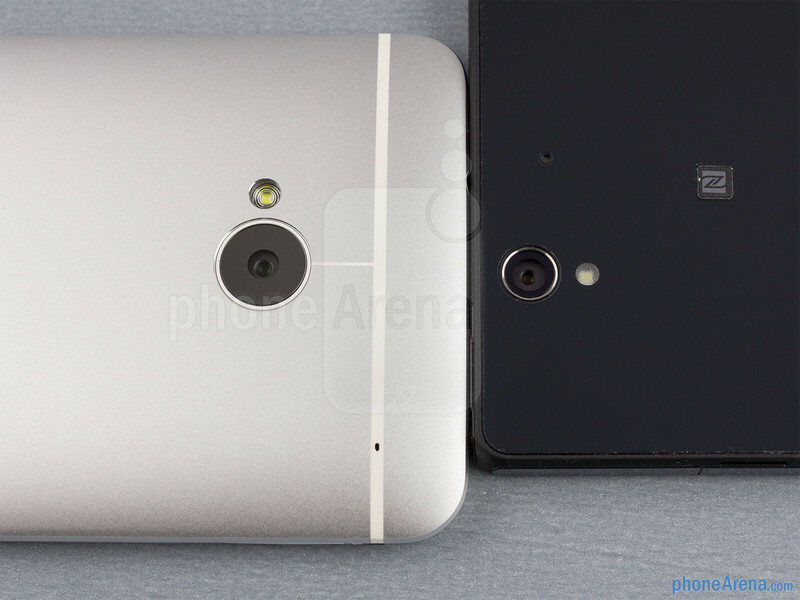 or YOU WANNA SAY SONY OVERSATURATED than HTC?????!!!!! You're dumb. People call them sheep because of WHY they buy Apple products. Sheep are the people who buy Apple products not for their specs or software or anything that the device actually has to offer over the competition but simply because it's made by Apple. Neither are for sheeps. Sheeps buy products not by their specs or software offerings but simply because of it's brand or status as a fashion symbol/trend. Hence why people call Apple fanboys sheep. Just because you buy three consecutive Samsung devices in a row doesn't mean you're a sheep. It depends WHY you bought that. If you used actual logic and reasoning or blind following, like SHEEP. If a device is clearly better in terms of hardware and software then it wouldn't make you a sheep to buy it over it's competition, regardless if you bought it's predecessor. Maybe the language barrier is why you're so dumb. What language do you need me to speak for you to understand? Once again I don't loyal to every company, I want choices!!! 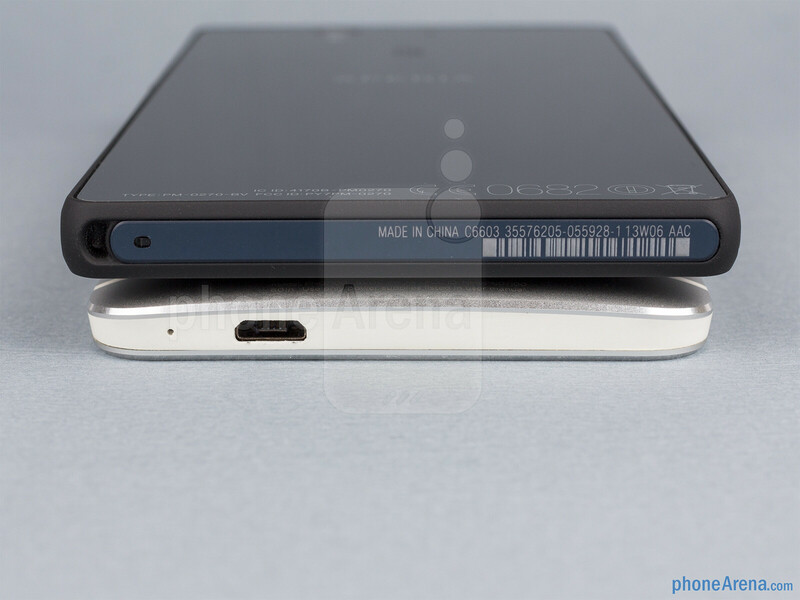 Getting Xperia Z in this October... What planet are you living on seriously? compare the one with ZL, ZL is cheaper yet compact. 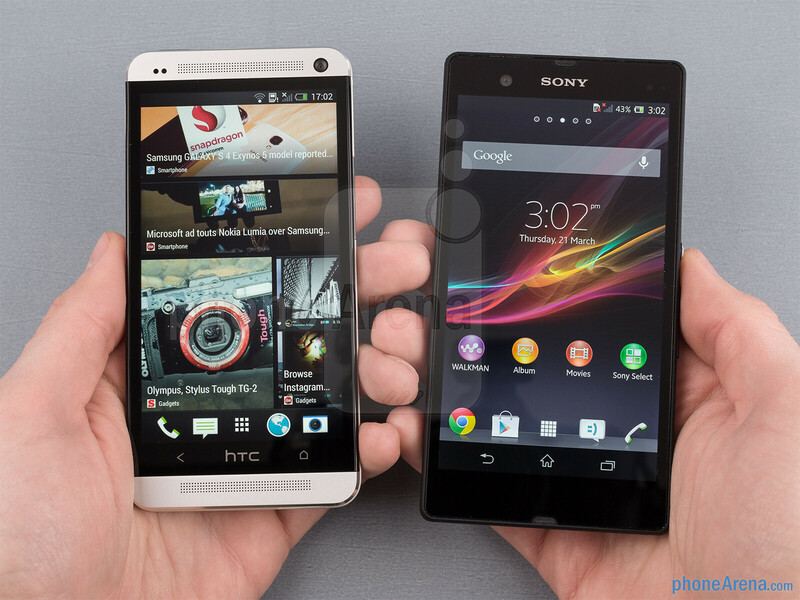 Htc One should be compared with xperia ZL. Yeah they are more similar.